'Almost Traditional' because we have substituted the Tapenade for a table olive jar of your choice: Herb & Garlic, Chilli & Garlic, Ligurian Style, Salad Blend or Red Wine Vinegar. Good value and best served with crusty bread and a glass of a delicious Adina red wine. An ideal, inexpensive gift for valued colleagues, clients or customers, especially those who love food. The olive tree is native to the Mediterranean Basin, traditional because the olives from these trees have been harvested and processed into oil dating back as far as 4500BC. Tapenade is an olive product that is documented back thousands of years in ancient Roman cookbooks. 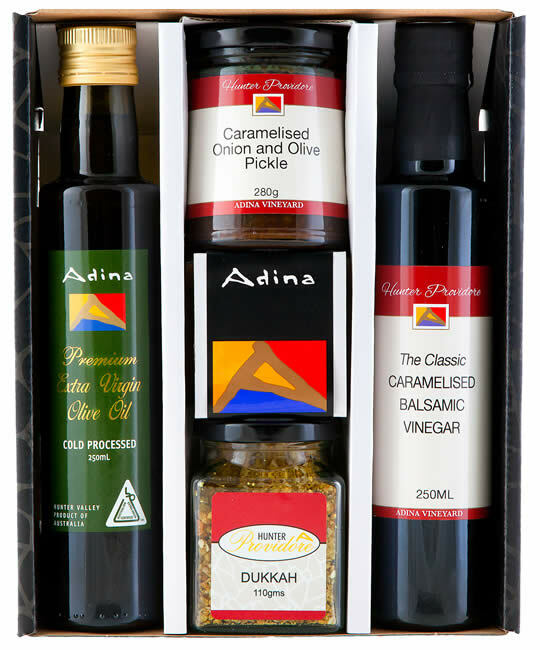 All inclusions in this Gift Box are perfect served with breads as dips. An ideal gift for valued colleagues, clients or customers, especially those who love food. Spice up that summer salad with either of these delicious dressings, add some Salad Blend Olives (we no longer stock the Caramelised Onion Pickles) to the plate and sprinkle the Dukkah over the salad for good measure, or, serve on the side with fresh bread and olive oil.